The monkey bridge over the Madlum River was built not as an attraction for tourists, rather it is a bridge used by the locals to cross the river especially when they are chasing time. It is composed of two cable wires stretched out on both sides, one used as a handle and the other is where you walk to move yourself to the other end. Traversing through the width of the river hanging several feet above it while carefully balancing yourself between the two unsteady wires is extremely difficult. Consider also other factors such as the gustiness of the wind and the wobbling wires, crossing the bridge is really frightening! Hahaha! 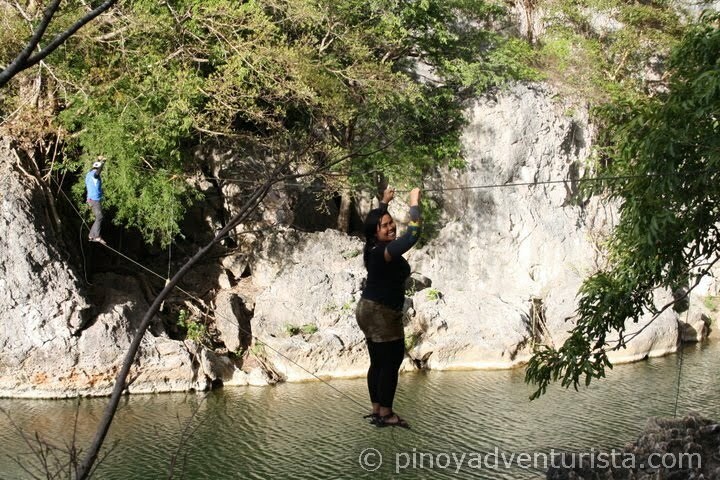 Shame on me, I call myself an Adventurista but I was not daring enough to cross that bridge. Hahaha! Yes I am afraid to try it! I don't know how to swim and there's no harness or even a life jacket, I don't like the idea of getting drowned if I fall off. It’s like "cross the bridge at your risk!" Hehehe! As I've said, the bridge serves it purpose of transferring people from one side of the river to the other end. It is not as if a mandatory act that you have to do. 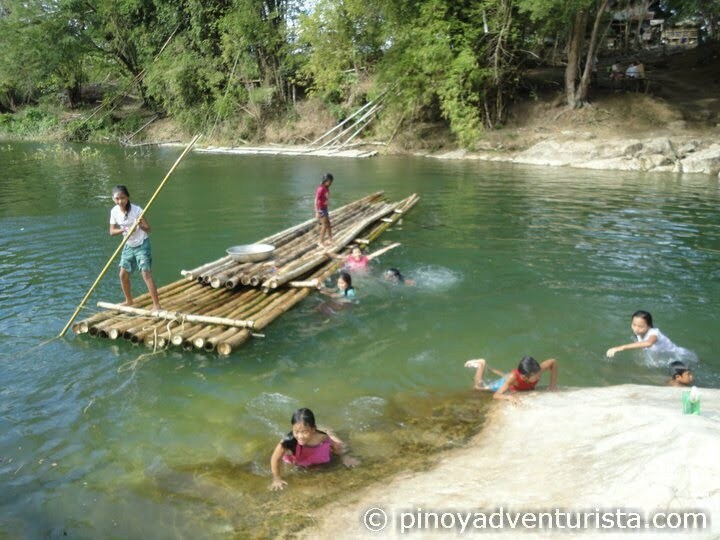 So, I just settled on the bamboo raft to cross the river. Safer? not really... Hahaha! Some of my friends tried it! 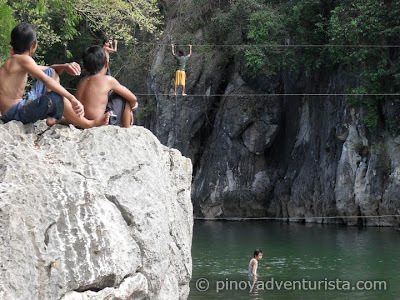 I was just contented watching and taking pictures of them traversing the bridge. They said, it's scary at first but when you get yourself stable on the wires, it's not as hard as it looks like. 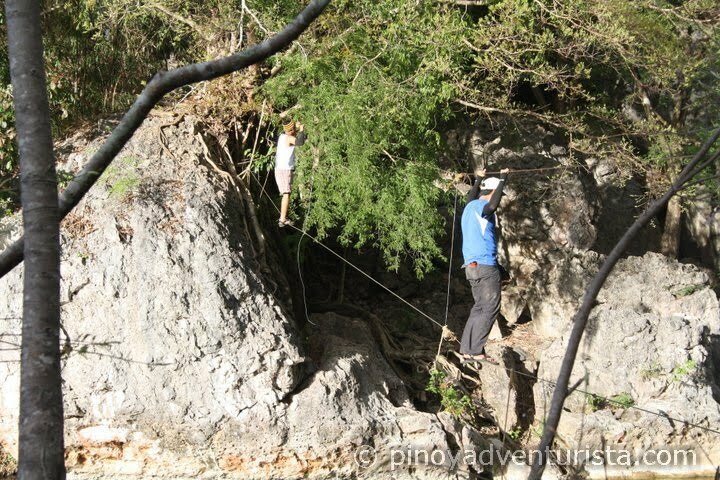 This is another adventure activity that you shouldn't miss! Highly recommended for dare devils who seek a thrilling experience. You can read my other posts on the activities we did on this 2-day adventure-filled weekend in San Miguel Bulacan (click on one of the links below). UPDATE (04/04/2011): Two weeks ago, my friend went back to Mt. Manalmon. A zip line had already been installed over the Madlum River, another reason that I should come back there. Hehehe! Maybe soon! This 2-day adventure happened last January 22-23, 2011 at San Miguel Bulacan. Here is a series of posts on this one of a kind mountaineering experience with my group, "The Sosyal Klaymers". Thanks to Ajel, Benj, Julius and Mitch for sharing some of the photos I used in this series. whaha katkot naman yung bride na yun! @axl - kelangan matapang ka talaga... hahaha!thanks! kailangan ng mga heart broken!.. haha! Na-uh...not for me. I don't like heights! Your friends were really brave. weh? dalawang cable wires lang? ang galing kaya hehehe. @Fetus - yes po... try nyo po... sabi ng mga friends ko madali lang daw... hehehe!!! next time itry ko na cya, pero magdadala nako ng life vest... hahaha!!! haha kakatakot naman tumawid sa ganyan! sir..if u pas thru the bamboo raft, mababasa k dn b? 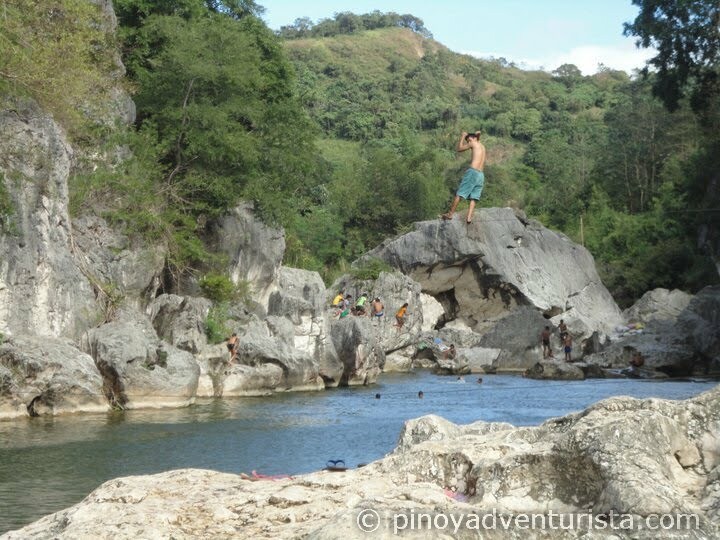 yung rock climbing/rapelling po ba mahirap?is there another way na hindi hndi ddaan sa river and rock climbing? do we have options? @christian - lakasan lang ng loob cguro yan... hehehe!!! @Bino - oo nga noh? yung hanggang mahulog ka... hahaha!!! try it! thanks po! Mervs. This kind of adventure is really frightening. I have fear in height, but I know how to swim. Sayang lang mervs hindi tayo nagkita sa MOA nun. Anyway may other time pa naman.:-). "...rather it is a bridge used by the locals to cross the river especially when they are chasing time." - Nagmamadali sila sa lagay na yan? Pagpapakamatay yan. Hahaha. kc akong dala kundi ang belt bag ko... lolz! @lakwatsera - yeah, nice cya... sa dami ng reactions na na-receive ko, na pressure tuloy akong bumalik dun at i-try na cya... hahaha!!! It looks fun! But I'm sure ang hirap tumawid dyan. 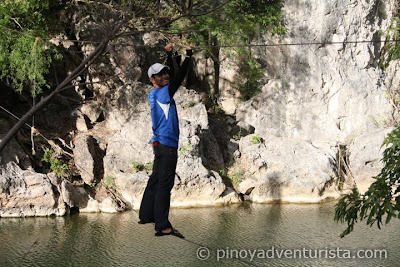 Bakit hindi na lang hanging bridge ang ginawa? Hassle naman nung wires. Haha. Lots of great reading here, thanks! I had been researching on yahoo when I identified your publish, I’m going to add your feed to Google Reader, I look forward to far more from you. ang cool ng place na ito... mukhang okay naman yung babagsakan. Would you recommend trying it kahit hindi marunong lumangoy? 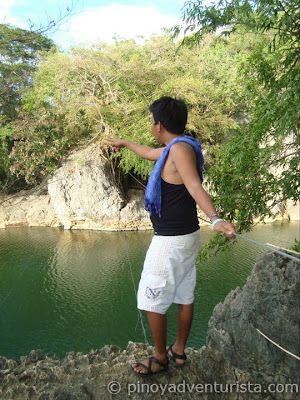 I really want to try crossing the bridge pero di ako marunong lumangoy. Haha!